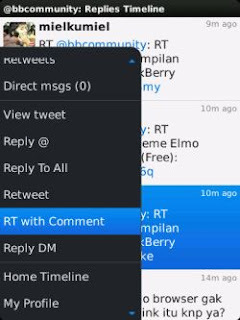 You get bored with Social Scope Twitter app, or Twitter UberSocial for BlackBerry? You want to find a simple Twitter app but brings the menus complete Twitter? Maybe you can try this application, called Kijamii for Twitter. Despite its name, a little weird, but the application is only a capacity of 1 Mb proved very reliable. Some of the advantages Kijamii applications, among others, there are no ads are very annoying and slow down the network, multiple accounts and can certainly go faster refresh updates, because the menu is a simple and lightweight application size. 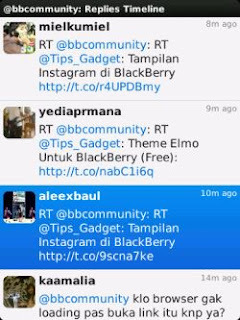 You have finished reading Download Kijamii- New Twitter Apps for Blackberry and many articles about Tech Gallery in our blog this, please read it. and url link of this article is https://littlebitjohnny.blogspot.com/2013/02/download-kijamii-new-twitter-apps-for.html Hopefully discussion articles on provide more knowledge about the world of new tech gadgets.